Program: "First or Worst Show and Tell." 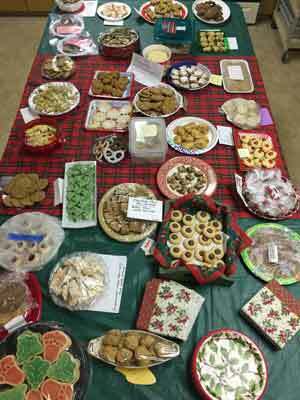 Merry May will facilitate the program. - Name drawing for "Quilt in a Jar." - Mini-Flag Project is due. 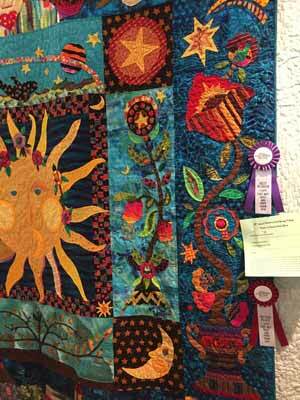 - Show quilt registrations due. 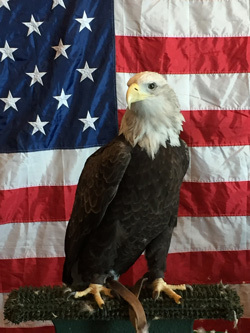 Saturday, May 4, 2019, 9 am - 1 pm at the Upper Cape Branch Library. 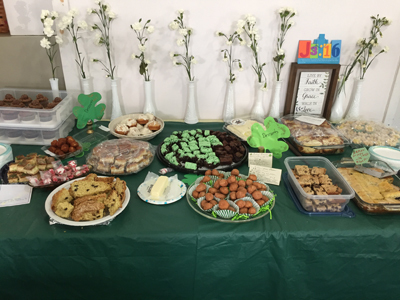 See newsletter for details. 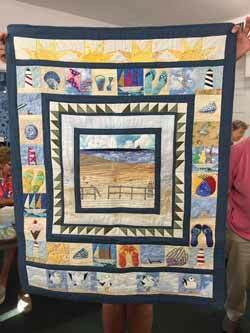 South Jersey Quilts of Valor Chapter Spring Fundraiser Wednesday, May 8, 2019, 4-8 pm @ Randazzo's Restaurant, 34th & Asbury Ave., Ocean City, NJ. 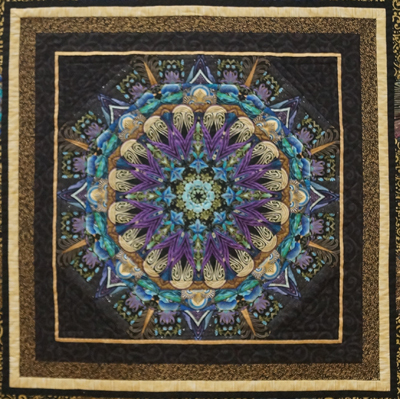 Kaleidoscope Wall Quilts, by SSS Guild member Elizabeth Ohlson, will be the featured show at the Ocean City Art Center for the month of May, 2019. SAVE The DATE: Friday, May 10, 2019, 7 pm for Elizabeth's show reception at the Art Center. 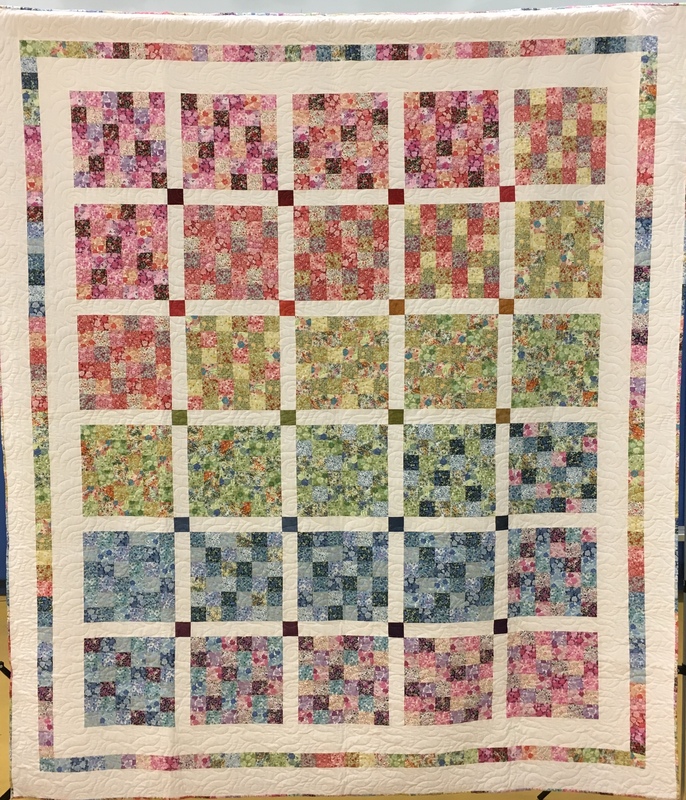 "Blossoms of Color for Cures"
Share this for SSS Guild member Elizabeth Ohlson's up-coming Show and Reception in May at the Ocean City Art Center. SAVE The DATE: Friday May 10, 2019, 7 pm for Elizabeth's Show Reception at the Art Center. 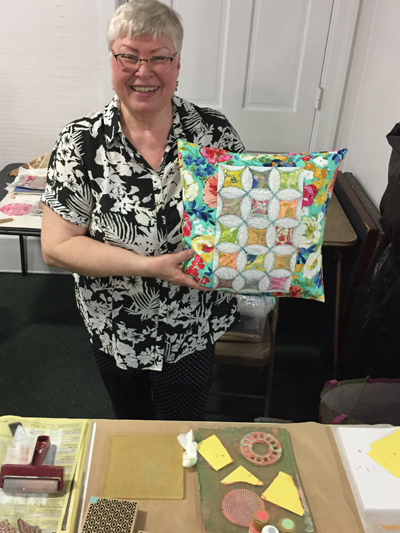 SSS Guild member Betty Lou Cassidy, demonstrated Gelli Block Printing at the April 8th Guild meeting. 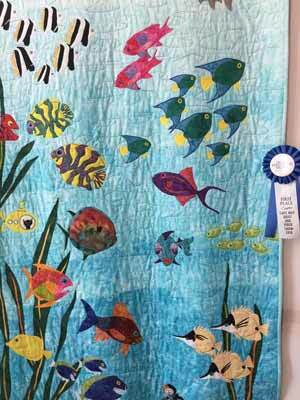 She used acrylic paints and many household objects and 'trash' for printing on fabric. 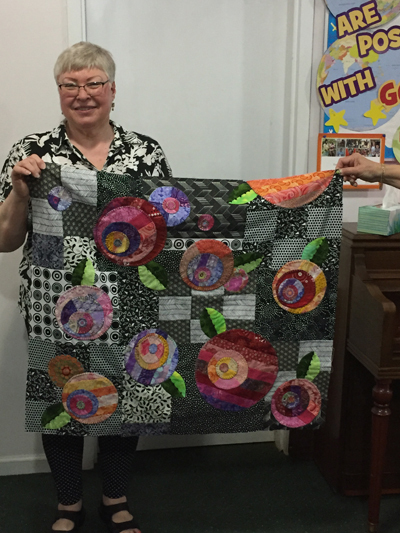 She also displayed many finished projects (pillow - above and quilt - below) that incorporated her printed fabric with other commercial fabrics. Merry May worked with some members on making special Sock Monkeys. 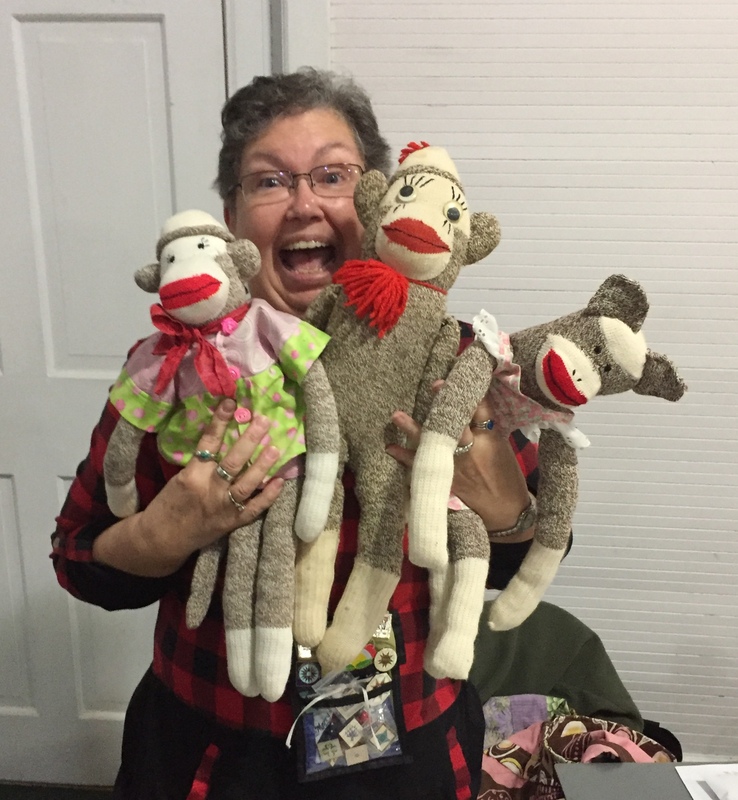 She is pictured here with some of her sock monkey friends. 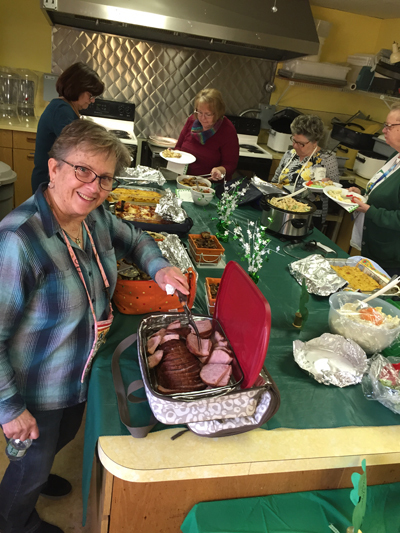 Hospitality Co-Chair Ronnie Sauerbrey serving up the ham slice! Guild members getting a little of this and a little of that! 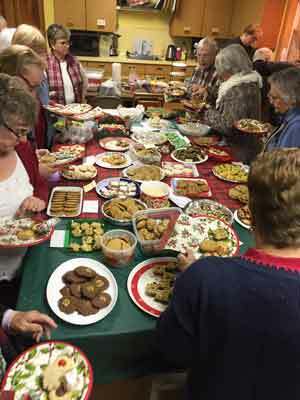 Many South Shore Stitchers Guild members participated in the Ornament Exchange held at the Dec 10th Holiday Tea. 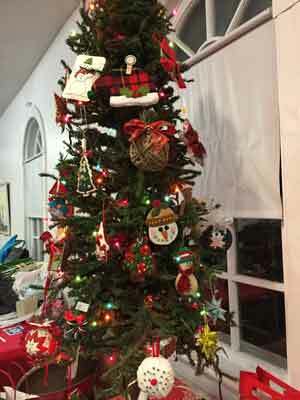 If a member brought an ornament, they got to take a different one home. 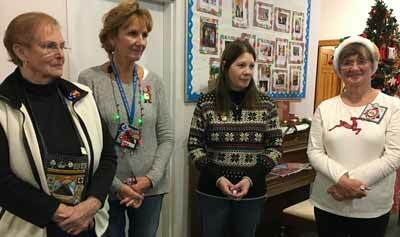 As the ornaments were handed out each member was acknowledged for bringing a beautiful handmade ornament. Members Jane P. and Kathy D. organized the Exchange. 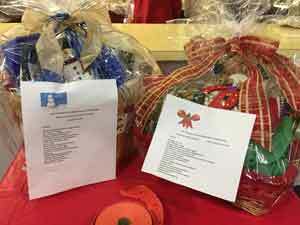 Two baskets, filled with quilting items, were raffled off at the South Shore Stitchers Guild Holiday Tea on Dec 10, 2018. 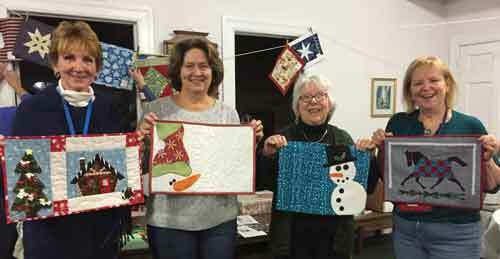 60 placemats, made by South Shore Stitchers members, were voted on at the Nov. 12, 2018 meeting. 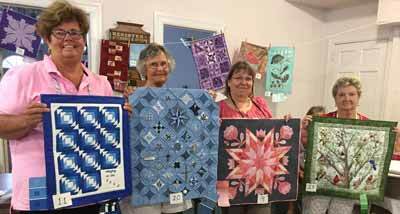 Pictured are the winning placemats, from left, Diana Easterday, first place; Cherie Barber, 2nd place; Bert McCaughey and Rosemary Lomanno, 3rd place tie. 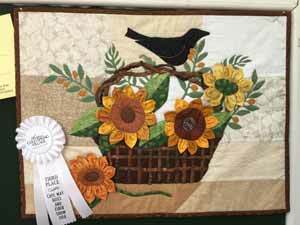 All placemats will be donated to the Meals on Wheels program. 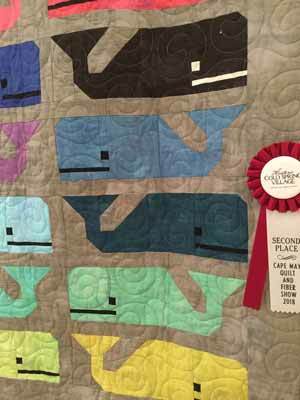 completed 192 pillowcases and won the Smile Makers trophy! Thank you to Diana Easterday for sharing this photo. 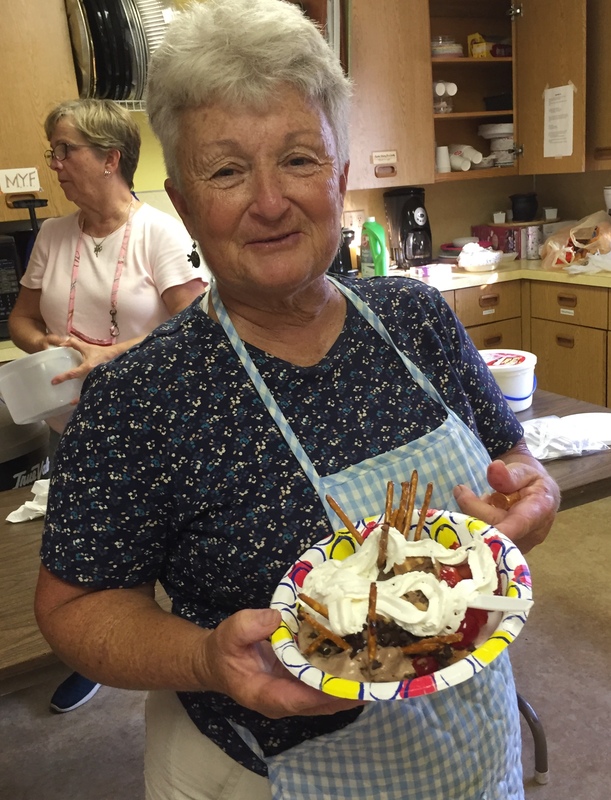 Hospitality Co-Chair Debbie Conrad demonstrates how to make the most of the South Shore Stitchers Annual Ice Cream Social and all the toppings - while her helper Co-Chair, Ronnie Sauerbrey is busy scooping up the dishes of ice cream. 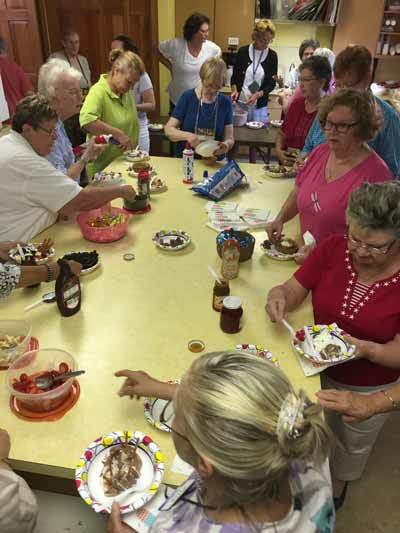 All the Guild members enjoyed full dishes of ice cream with a variety of toppings and goodies. 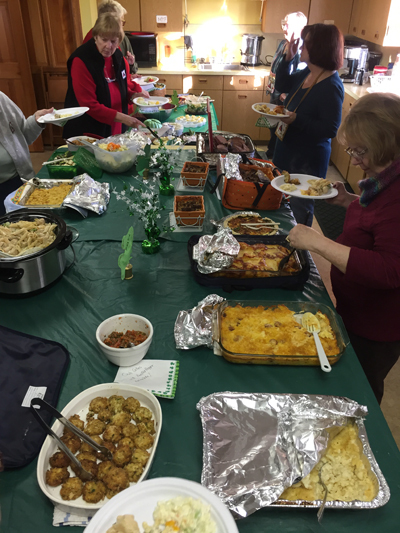 It takes lots of helpers to feed some hungry Guild members! 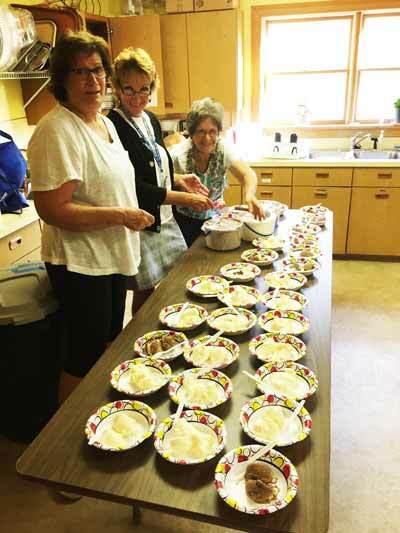 Front to back - Sue Hanlin, Diana Easterday, and Elsie Carey. At the July Guild meeting members signed up to participate in a ‘Round Robin’ Quilt Project that will be completed in 2019 and will be displayed in the October 2019 Guild Quilt Show. The above photos were examples shown by the committee chairs of past projects. Round Robin participants will be divided into groups. 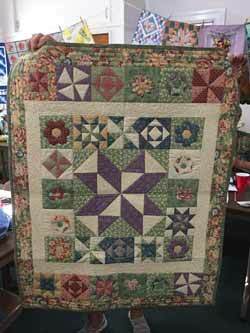 Each member makes a center 12 ½” block. 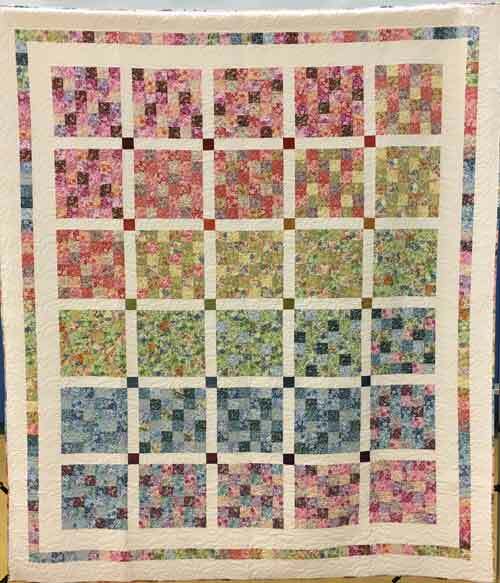 The block is then passed to the next member who makes four 4 ½” blocks. 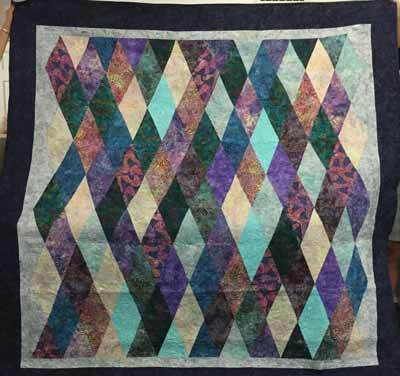 Then the next month the project is passed to another member of the group until the quilt is ready to pass back to the original member who then assembles the quilt – and keeps it. $41. 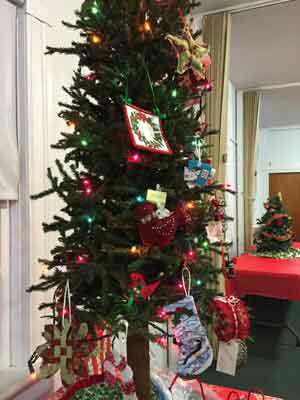 see newsletter for details. 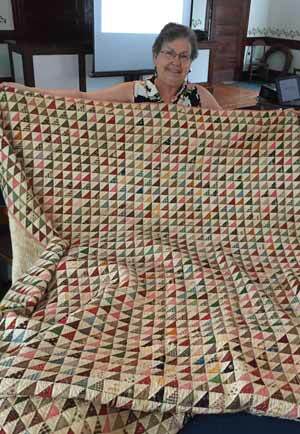 On Saturday and Sunday at the 28th Annual Quilt and Fiber Arts Show at Historical Cold Spring Village, SSS member Merry May, gave her presentation of 'South Jersey Quilting History'. 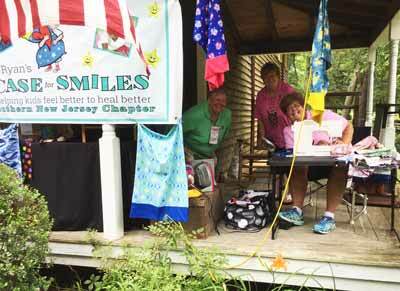 National Organization 'Ryan's Case For Smiles' was represented at Cold Spring Quilt and Fiber Show on Saturday and Sunday, June 23 and 24, SSS members Sharon Cadwell, JoAnn, and Jane sewed pillowcases on the porch both days! Stockton University students in the Occupational Therapy program participated in a 'sew day' on Tuesday, Mar. 27, 2018, to make pillowcases for Ryan's Case for Smiles. 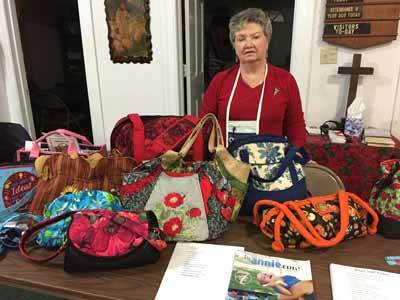 They pinned, sewed, and ironed the cases that will be given to children in area hospitals. 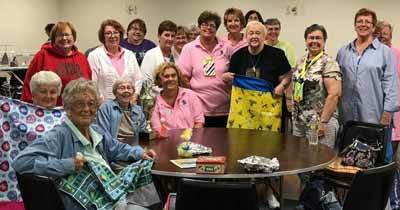 SSS Guild member, Sharon Cadwell and her team of helpers worked with the students to make dozens of pillowcases. 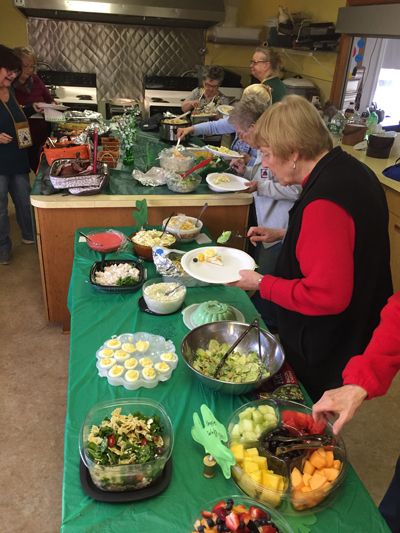 Students in the two volunteer groups are pictured above and below. at the Upper Twp. Community Center. 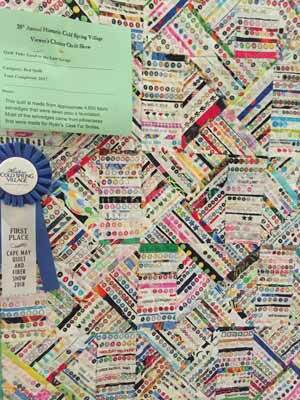 about your favorite or least favorite quilting tool. 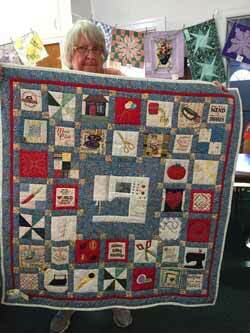 for South Shore Stitchers Quilt Guild. Pam Horton, Treasurer; and Nancy Jefferson, Secretary. Sit down and put your feet up and revisit the show. Thank you Carol Campbell for your beautiful photos.